Solid hardwood flooring is made of solid pieces of wood. It can be used in any room as long as it is above ground. 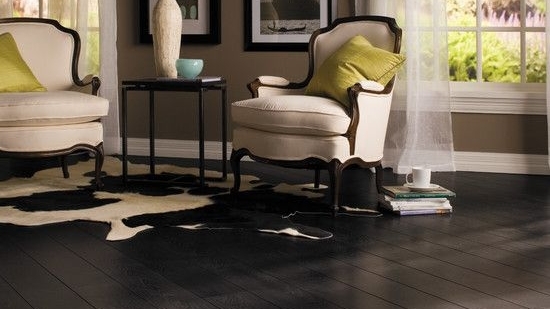 Solid wood flooring is timeless and can be refinished up to ten times depending on thickness. Another added benefit to solid wood flooring is that you can choose between factory finish or a finish applied after installation. One drawback of solid wood flooring is that it is very sensitive to humidity and temperature fluctuations which may cause it to expand, contract, gap, or even warp. To ensure the integrity of your solid wood floor it is crucial to maintain proper humidity levels in your home, somewhere between 40%- 50% year round. 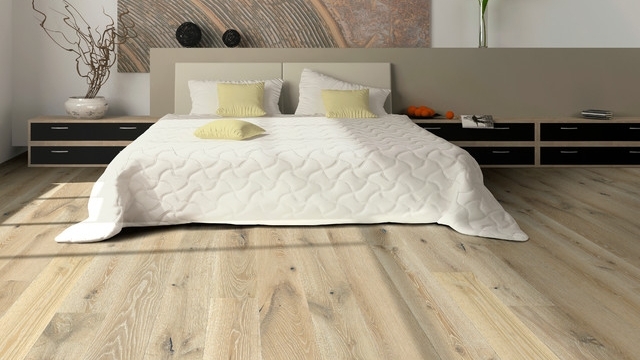 Visit us today to browse our selection of solid wood flooring. Engineered hardwood flooring is comprised of two or more layers. The top layer is a real wood veneer, usually between 2mm and 4mm in thickness. The layers below are either plywood, high-density fiberboard, or solid wood. These layers are staggered and bonded together under intense pressure. This type of construction allows for a hardwood floor that has superior structural integrity compared to solid wood flooring. That means that it is suitable for any room in your home, on, or below ground, and is available in wider plank sizes than its solid wood counterpart. An additional benefit to engineered flooring is it can be installed as a floating floor, which means that it does not have to be nailed or glued down. The only downside to engineered flooring is that it can only be finished once or twice, but it is not recommended. 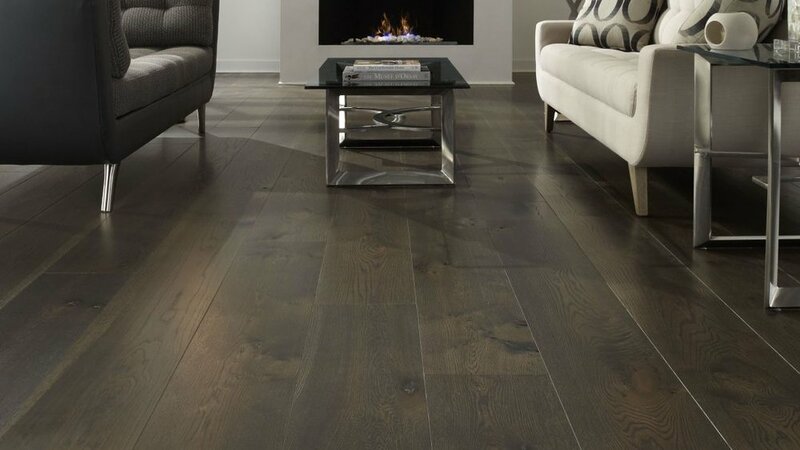 Visit us today to browse our selection of engineered hardwood flooring. Laminate flooring consists of several layers and is manufactured using recycled wood products. The base layer is made from recycled wood and is compressed into high-density fibreboard which sits atop a backing layer. This is topped with a vinyl image layer and then coated with several layers of clear protective resin. The protective layer on laminate makes it extremely durable and is perfect for families with children and pets. An additional positive feature of laminate flooring is easy installation; tongue and groove planks can be loose laid and "clicked" together and removed just as easily if necessary. Although laminate flooring has many benefits including affordability, it is important to note that it is susceptible to excessive moisture and can swell. For this reason, laminate is not recommended for any room where it has a high chance of water exposure. 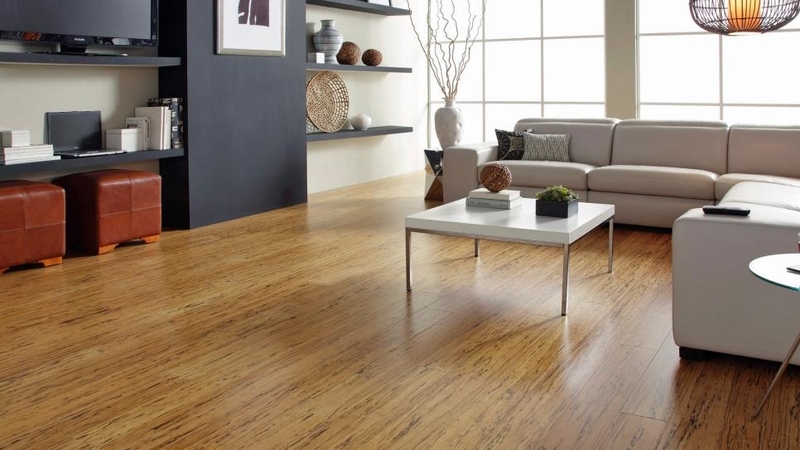 Visit us today to browse our selection of laminate flooring. Cork is peeled from the renewable bark of the cork oak tree. Most of the worlds cork is produced in Portugal, accounting for over half of the worlds supply. It is a renewable resource that is 100% natural and eco-friendly. Cork has a molecular structure similar to a honey comb, with each cubic centimetre containing millions of cells that are filled with an air like gas. This unique property of cork offers superior thermal insulation, providing a warm floor year round. It also makes cork an excellent sound absorber that reduces the transmission of sound within your home. Cork is also softer than its hardwood counterparts and provides a more comfortable surface to walk on. It is gorgeous product that you can feel good about. 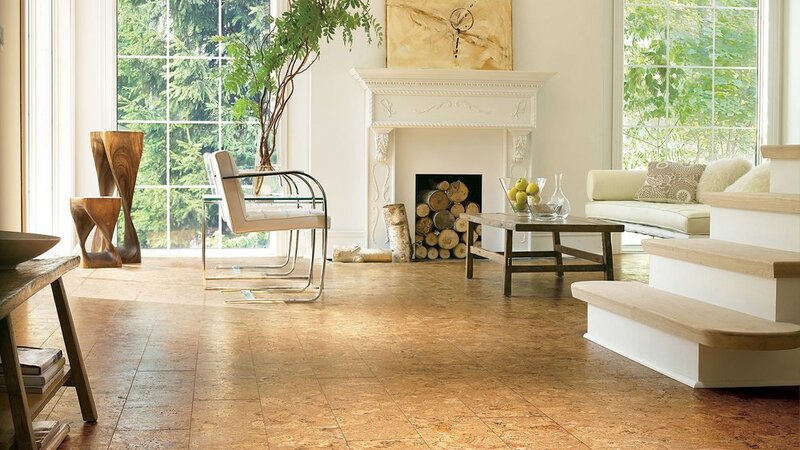 Visit us today to browse our selection of cork flooring.